Our Events: Mad Men Season 6 Premiere Party — Everybody's Invited! Mad Men, AMC’s award-winning period drama, will return on April 7 for a sixth season. We here at Everybody’s Invited! think that sounds like a reason to party! We recently hosted a Mad Men pre-premiere party with some of our friends. We hope our 1960s shindig will inspire you to bust out your whiskey glasses and dust off your record player! The Vibe: Imagine it’s 5pm on a Friday in the Sterling Cooper Draper Pryce offices. Mr. Draper has just landed a big client, and everyone — the creative team, secretaries, sales guys — is celebrating this victory with a little post-work week happy hour in the office. Grab a cocktail, loosen your ties, and kick off your heels. Get ready to twist and shout! Decor: Mid-century madness! 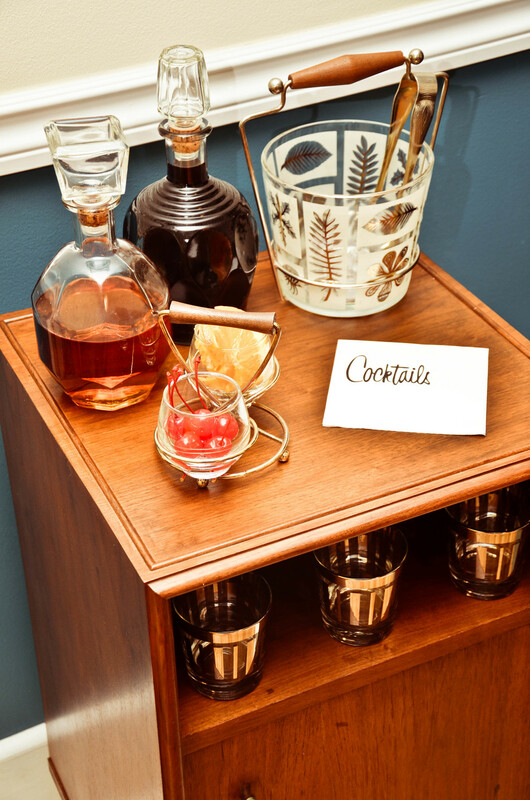 We took our inspiration directly from the Sterling Cooper Draper Pryce offices: Tapered-leg furniture, starburst clocks, whiskey decanters and vintage barware, a vintage typewriter, rotary phone, and Rolodex. Vintage advertisements (all found for free online, and mounted on cardstock) adorn the walls and inspire the employees (a.k.a. party guests) of Sterling Cooper Draper Pryce. Vintage matchbooks, candy cigarettes, cocktail napkins, an issue of LIFE magazine from 1968, and 60s fashion books cover the coffee table. Styling: Dapper, Draper-style narrow-lapel suites and cardigan sweaters for the fellas. Pearls, pencil skirts, and false lashes for the ladies. Teased updos, winged eyeliner, bright coral-rose lipstick, form-fitting frocks, and high heels were also part of the working gal’s guise in the 1960s. Favors: Party favors include Mad Men “essentials”: mini whiskey bottle, candy cigarettes, and vintage matchbooks inside a whiskey glass. More information about favors coming later this week on the blog! Food: Simple, vintage-style appetizers, like pimento cheese spread on Ritz crackers, tuna salad-stuffed tomatoes, and Pigs in a Blanket. More details about our “Mad Men-u” coming later this week on the blog! Drinks: Cocktails, of course! Mix Don Draper’s favorite, Canadian Club whiskey, in a classic Old Fashioned. Top it with an orange slice and a cherry or two.More details about our cocktail menu coming later this week on the blog! Activities: Brainstorm your best ad copy for a mock sales pitch! More information about activities coming later this week on the blog! Are you attending a Mad Men season six premiere party? No? Well now you’ve got the tools and ideas to host your very own event! Tell your friends to be there or be square. See more photos of our Mad Men Season 6 Premiere Party on the Everybody’s Invited! Events Facebook page. Special thanks to our retro-fied friends who let us doll them up like Joans and Dons – you’re the bee’s knees!